Our Alessandra Chiara of LeCodette gives us a taste of kitchen’s dictionay. Mix two or more ingredients in order to incorporate them to one another to form a homogeneous mixture. Rehydrate dry foods such as raisins or dried sheets of gelatin. Is an indirect cooking which is obtained by placing the bowl containing the ingredient to be cooked or dissolve on another container filled with hot water. Is necessary to prepare cakes which the filling does not require baking. Method: Roll out the short pastry dough with a rolling pin and place it in a baking pan, cut the parchment paper or aluminum foil and place it on the dough and fill the cake-pan of dry pulses. Bake the tart for about 15 minutes in a preheated oven at 200 °, then baked the cake, remove the beans and paper and bake again for about 15 minutes in a preheated oven at 200 minutes, then remove the beans and paper and bake again for an additional 10-15 minutes at the same temperature. A sauce made with fruit, lemon, sugar and water that have typically been puréed and strained to create a thick sauce-like consistency. Any cream or custard that serves to fill. Put the filling into a cake or cupcake for example. Starchy substance that is used as a thickener for creams, puddings, and sauces. It is also used in the preparation of cakes and other baked desserts as it helps to make them particularly soft and fluffier. Cover a pan with parchment paper, aluminum foil or a dough. Melt a solid food such as butter or chocolate, for example, to very low heat to avoid to take him to a boil and changing the organoleptic characteristics of the product. Is usually mentioned in the preparation of home-made pasta, or for any sort of pastry-dough. Is created by making a sort of volcano of flour in which (in the cavity) will be placed the other ingredients. Covering made ​​of sugar or chocolate, which is used to decorate cakes, pastries etc. Cover the cake or cupcakes with icing. Decorate cake, cupcake or other yummy treats with sprinkles, colored sugar, chocolate chips and other edible decoration. Brush the inside of a pan with butter, then add a little bit of flour and tilt and rotate the pan so that all the surfaces are coated with flour. This is to assure that your baked cake will release from the pan perfectly. Working two or more ingredients homogeneously, to obtain a single dough, with the elasticity and softness desired. Slowly add the other ingredients. Flour a work surface or a baking pan before proceeding with the preparation of a dough to prevent sticking. Sprinkle with a liquid the bases of cakes, bread, cookies, etc. to soften and flavor them. Pour dressing or sauce on a food in order to sprinkle it abundantly. Flour that is derived from corn, which is used as the potato starch to thicken sauces. It can be added to wheat flour to make soft the cakes. Working a mixture or an ingredient with a whip in order to make it more fluffy and consistent. Whisk the egg whites vigorously at room temperature with a pinch of salt, until stiff peaks form. Mix vigorously, usually with a whisk, the ingredients. Sifting is a way to lighten flour that’s gotten packed down in a bag during storage and shipping. It’s also useful for mixing dry ingredients together and making sure there aren’t any stubborn clumps. With a brush, usually dipped into albumen, milk, or beaten egg yolk, brush the surface of biscuits, cakes or other stuff before putting them in the oven to get a browning surface. Sprinkle evenly with powdered sugar, cocoa, flour or other powdered ingredients a surface, or a dessert. 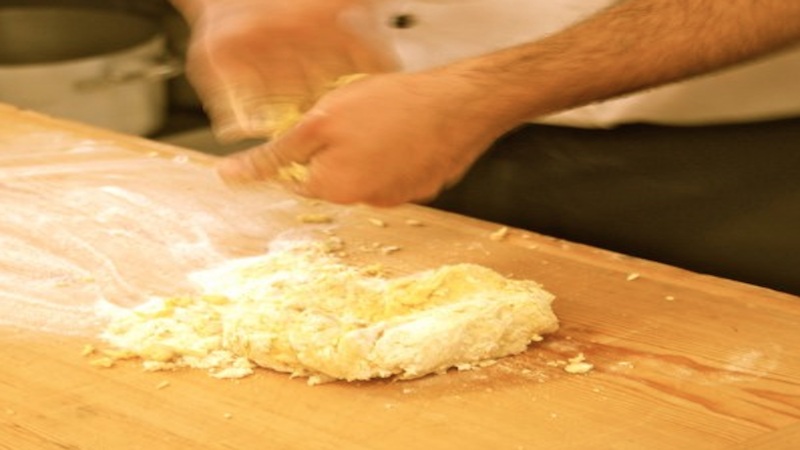 Pull the dough with a rolling pin to create a sheet of pastry of the desired height.